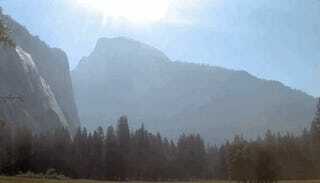 A timelapse of Yosemite Valley on Tuesday as it fills with smoke. The Ferguson Fire has been burning on Yosemite National Park’s doorstep since July 13. Now it’s trying to barge into the park, forcing visitors to evacuate from its namesake valley. On Tuesday, the National Park Service announced that Yosemite Valley, Wawona, and Mariposa Grove will close to visitors on Wednesday at noon. Those staying in campgrounds and lodges there are being told to get out while firefighters try to subdue the wildfire, which has burned at least 36,587 acres and is 25 percent contained. The closures are in addition to 13 other campgrounds, lodges, and communities outside the park that are under evacuation orders. In addition to the risk of being trapped by fire, air quality has been downright atrocious in the valley. The San Jose Mercury News reports that air quality is worse than in Beijing, with particulate matter topping out at 518 micrograms per cubic meter last week. The safe level of particulate matter designated by the Environmental Protection Agency is 35 micrograms. The gorgeous views that attract 3 million visitors to the park annually are downright nonexistent at the moment. The valley, which is home to famed rock formations El Capitan and Half Down, has been shrouded in a thick veil of smoke. California is all too familiar with destructive wildfires. The Thomas and Wine Country fires exacted a huge toll on the state last year, killing 43 people and causing a combined billions in damages as part of the most costly wildfire season in U.S. history. The Ferguson Fire itself is burning near a burn scar from the 2013 Rim Fire, the fourth-largest fire in state history. Rising temperatures and increasing weather whiplash are turning California’s wildfire season into a year-round phenomenon.